No one thinks of the bathroom as their favorite room in the house. But after you see these amazing DIY projects, you might change your mind! There is no reason the bathroom should be ignored when it comes to decorating. This list has everything you need to give your bathroom an upgrade, from pretty decor ideas to clever storage solutions. Love that rustic farm house look? We have tons of ideas to fit that decorating style, featuring weathered wood, brushed metals, and beautiful stone. And don’t forget the Mason jars! Many of these ideas can be completed in a snap, perfect for those who are just starting out in the DIY world. From using old candle jars as storage solutions to adding rope to a plain trash can to make it cuter, even the most novice crafter can do them. If you want more of a challenge, try our more in-depth bathroom projects. New shower floors, light fixtures, and cabinets can be made in an afternoon but enjoyed for a lifetime. Keep on reading to learn more about all 26 cheap and easy DIY bathroom ideas! This ladder made with wood that looks weathered adds a rustic focal point to an area of the bathroom that is normally bare. Simple DIY bathroom ideas such as this one add extra storage for one of the smallest but most used rooms in your home. You can add more rungs for towel bars or attach shelves and baskets for more storage. 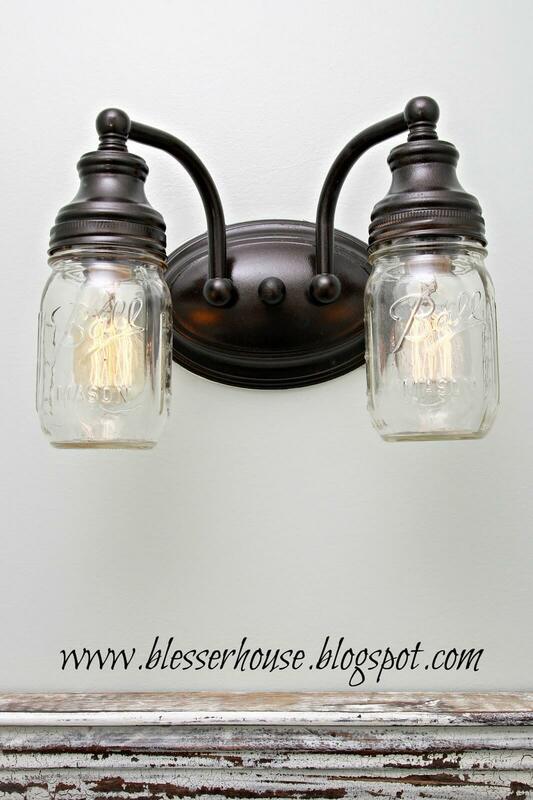 Canning jars add a rustic touch wherever you use them. You can leave them clear, whitewash them, or paint them in pastels or any other color. They can be used for storage with or without lids or as vases. This display shows a different idea with a plunger in one jar so that the jar can be used for lotions. No need to settle for a plain mirror or pay a large amount for a decorative mirror. With this simple idea, you can add a tiled-look to your bathroom. 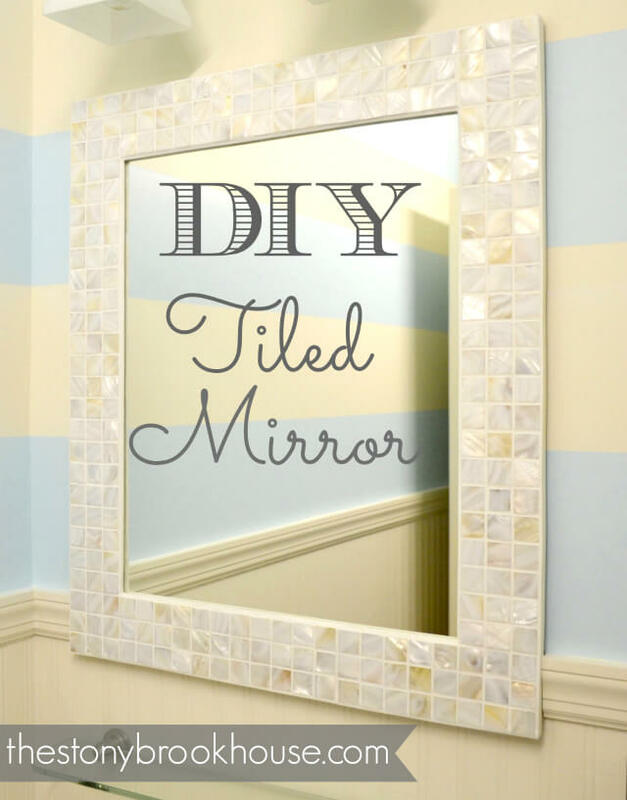 All you need is to create a wood frame for a mirror and decorate with tile and grout. It is a perfect highlight above your bathroom vanity. 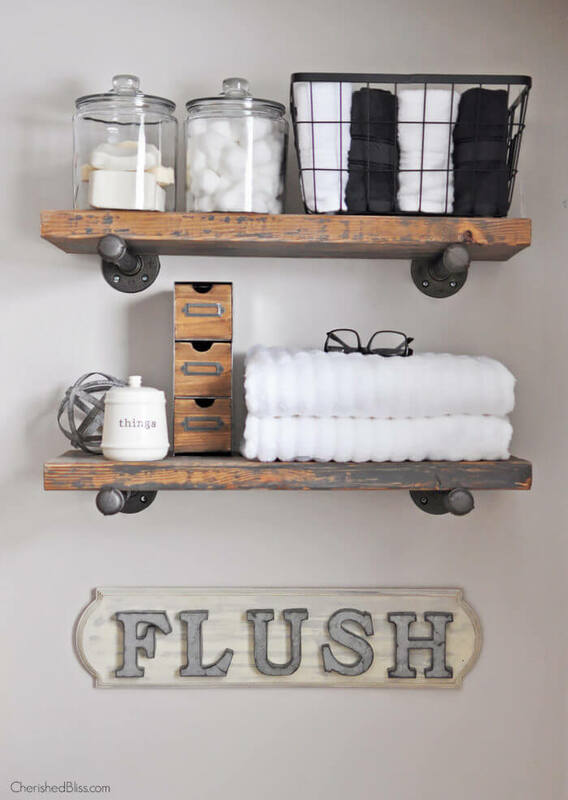 The wood and metal hardware create these inexpensive rustic-looking shelves that also add a combination storage and decorative space to your bathroom. A trip to the hardware store can provide a multitude of inexpensive items that you can use as brackets to hold wood shelves. Then, get some boards, finish them to coordinate with your bathroom, and you have a decorative storage area that could prompt guests to ask where you got them. Jute adds a natural and rustic texture to your bathroom. 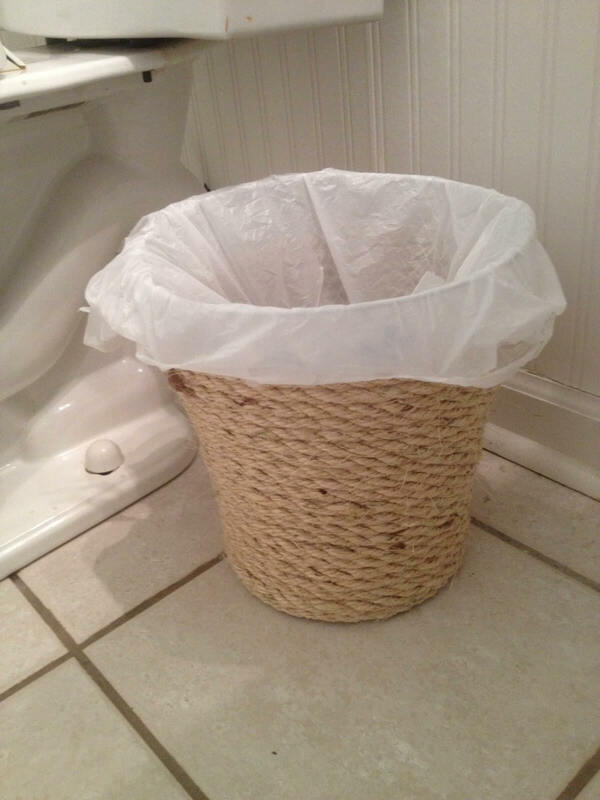 A simple wastebasket becomes unique wrapped in jute using a hot glue gun. You can make it all one shade of jute or create stripes with multiple shades of mute. After you have created the wastebasket, consider other DIY bathroom ideas that add more touches of texture to your bathroom with jute. Bring touches of color from the traditional farmhouse palette into your bathroom. Painting your bathroom vanity and other cupboards makes them stand out and be less ho-hum. Add more touches of the color from your throw rugs, shower curtain, towels, and floral arrangements to highlight the cabinets. 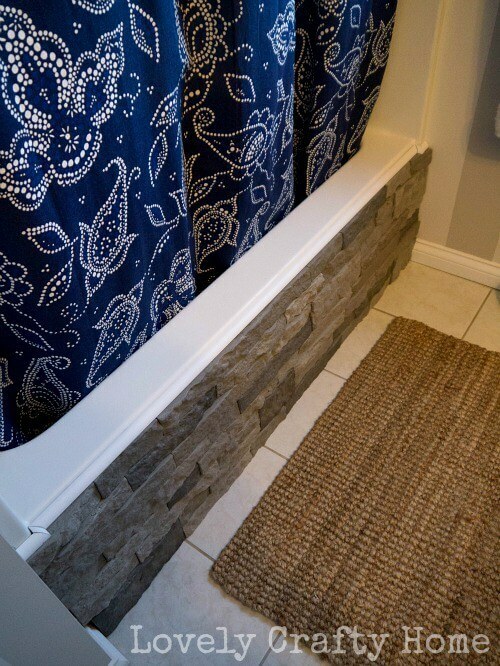 This simple DIY idea uses a faux stone veneer that is inexpensive and easy to use. It can be used indoors or outdoors. An immediate idea is to use it as a back splash, but using it on the front of this tub takes this tub from boring to elegant. It gives the tub the feel of an outdoor spa. The stone-look adds a natural rustic texture to the bathroom. The tub becomes a focal point to build on for the rest of your bathroom decor. This adds sophistication to the idea of attaching canning jars to a board to hold small items or floral displays. To keep it farmhouse rustic, copper cups were used along with a colored cord, Copper provides warmth and brings to mind copper pots and tea kettles. This easy and decorative DIY idea organizes brushes and small make-up items. 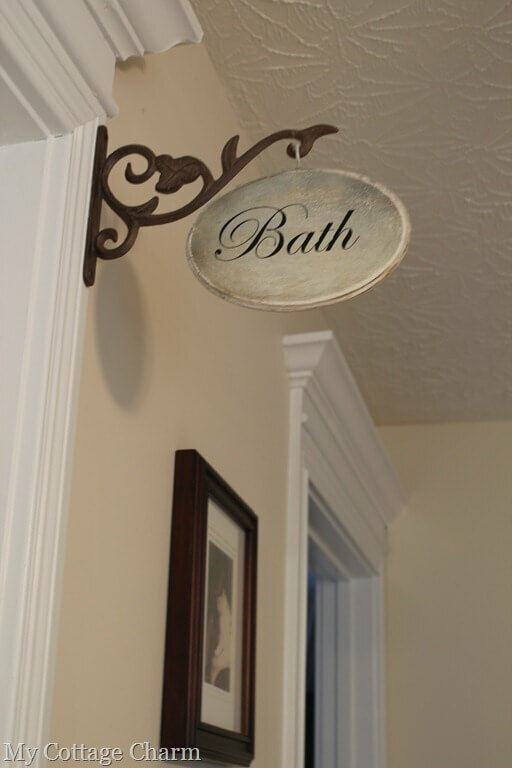 This simple, inexpensive, DIY idea brings to mind the decorative signs that hung by the door of businesses long ago. These signs can help guests get the layout of your home, and they create a vintage feel. They only require three items a plant hanger, a cup holder, and a small oval wooden plaque. Here is another solution for a plain boring mirror. This mirror is large, so tiling on a wood frame would be expensive. However, decorative wood frames are easy inexpensive, DIY bathroom ideas that elevate the look of the mirrors. You can make this frame using either reclaimed barn wood or wood that you have treated to look like weathered barn wood. Just gluing the frame onto the mirror makes this DIY project easy. If you look in the mirror, you will see that the weathered barn wood was also used on the bottom half of the bathroom walls. 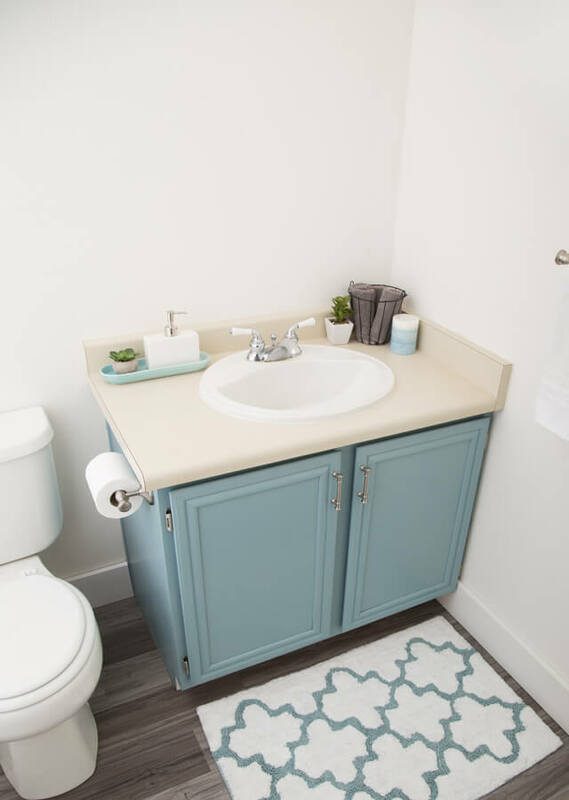 By now you should be thinking that even though the bathroom is a utilitarian room, DIY bathroom ideas can create a look that way more than utilitarian. Bringing an outdoor, natural, rustic-look to the floor of the shower is an extension of that idea. Looking at this shower floor brings to mind a garden path or a stream bed. 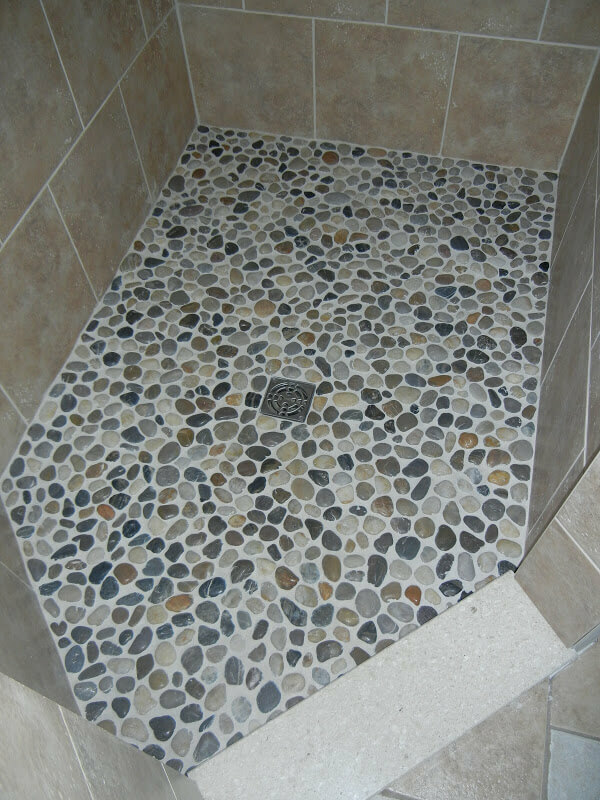 Buying bags of pebbles and using grout gives you the opportunity to arrange the color pattern of the floor. When you finish, you will have a work of art that you will make you proud. Now, are you ready to dress up the standard, builder-look bathroom fixtures? Well, you don’t have to buy expensive new bathroom fixtures. Just buy a can of spray paint along with tape and tarps to protect areas that you don’t want to paint. You will have shower fixtures that pick up the main or an accent color of your bathroom. 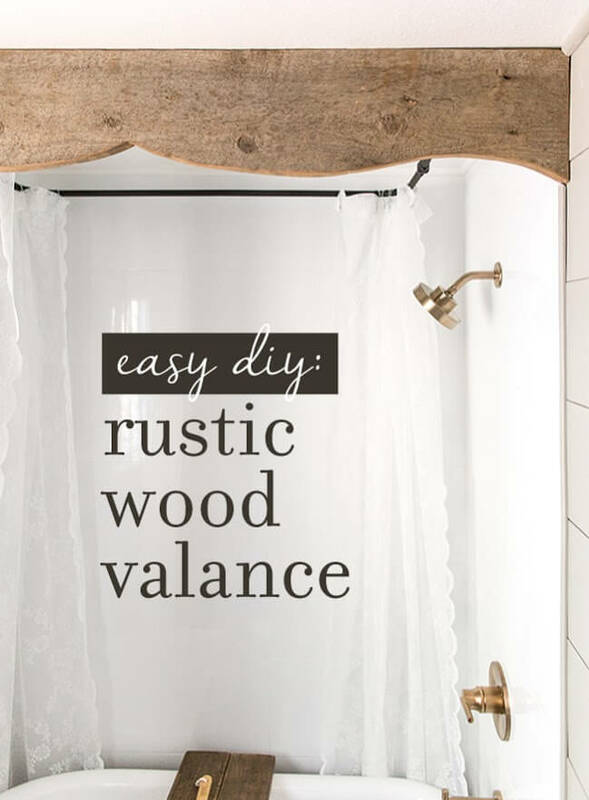 Here is another way to add a weathered barn-wood-look to your bathroom by creating a wood valance for your shower. DIY bathroom ideas such as this one may not occur to many people, but it adds character to your bathroom. The wood valance hides the cold metal shower bar and the wood adds warmth and hominess to your bathroom. You are sure to get compliments for this clever DIY idea. 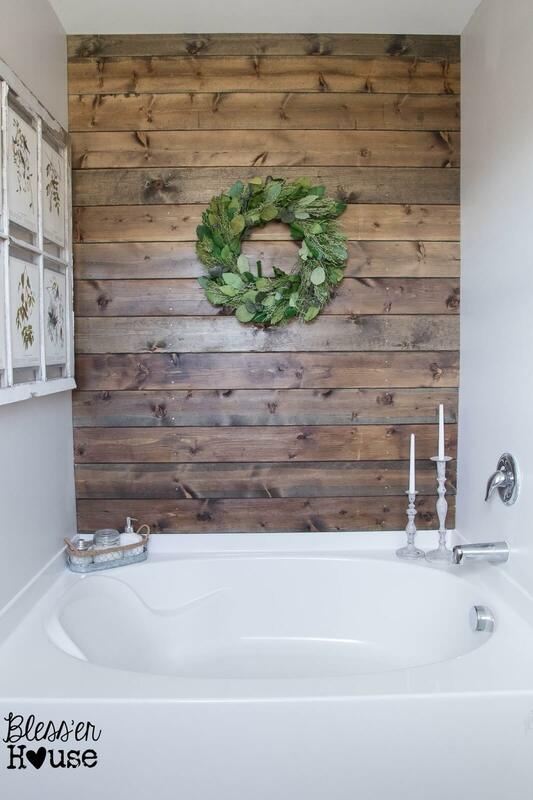 This DIY idea use weathered barn wood as a focal point behind the tub and helps create the feel of a private sanctuary. The wreath and the old window finish off the rustic look in this area of the bathroom. This is a easy, inexpensive idea that would give your bathroom a unique look. If you would like a new countertop but really can’t afford it, this idea may work for you. Use granite-look Contact Paper. 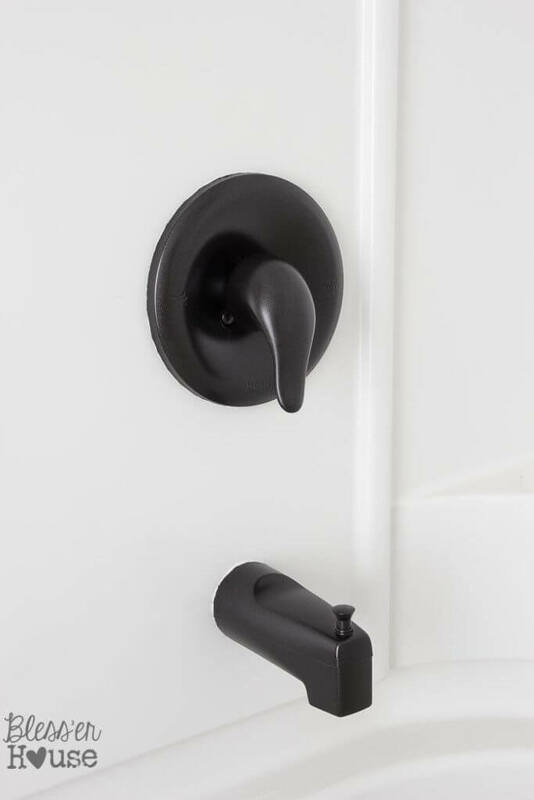 It is inexpensive and it provides an overall lift to the look of your bathroom. 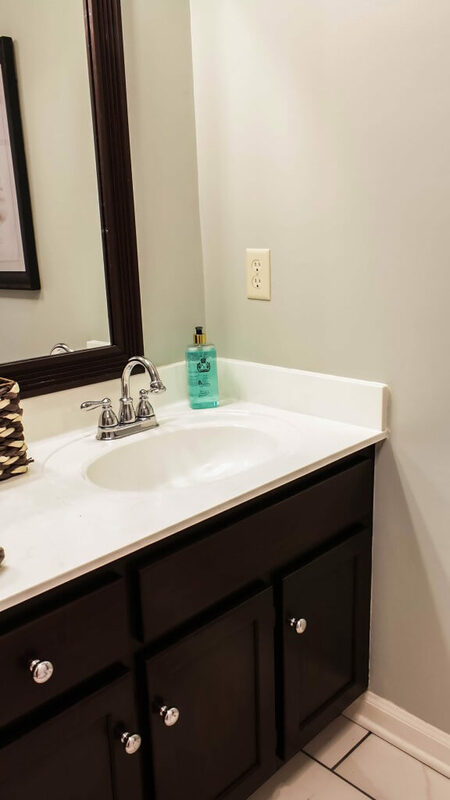 So, give your bathroom a new countertop with this DIY idea and see if you can use Contact Paper for more DIY bathroom ideas. 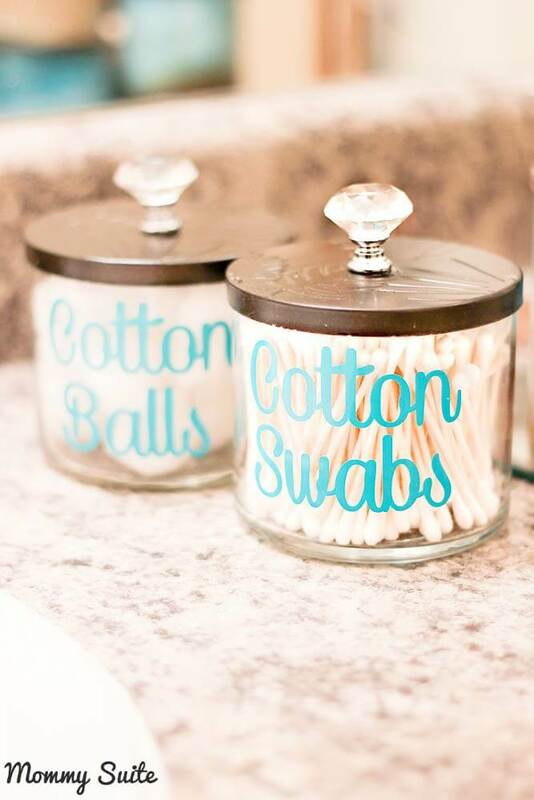 For a different look, use candle jars as apothecary jars instead of canning jars. Just make sure that you keep the lids when you open the candles. Candle jars still give a vintage feel, but are a bit more elegant and less country. 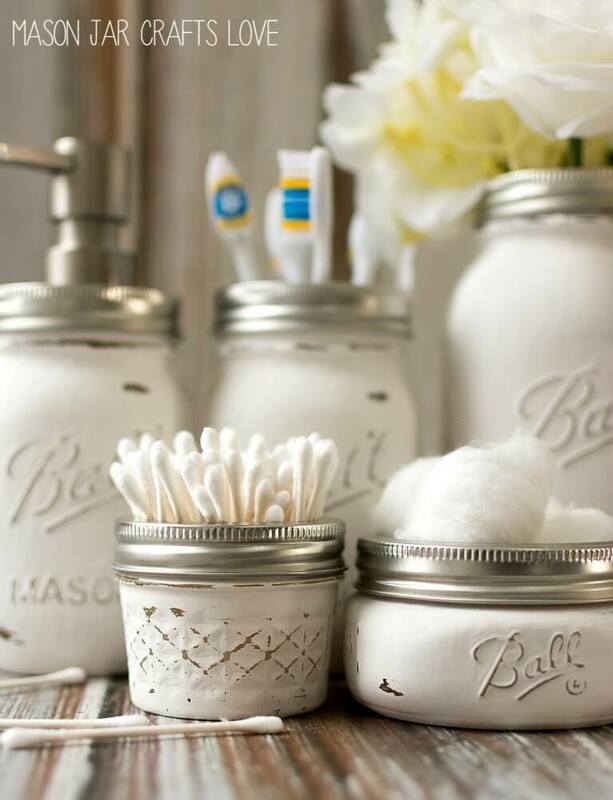 For more DIY bathroom ideas, look at all the product containers that you buy as possibilities for repurposing into storage containers, vases, or other home decor items. 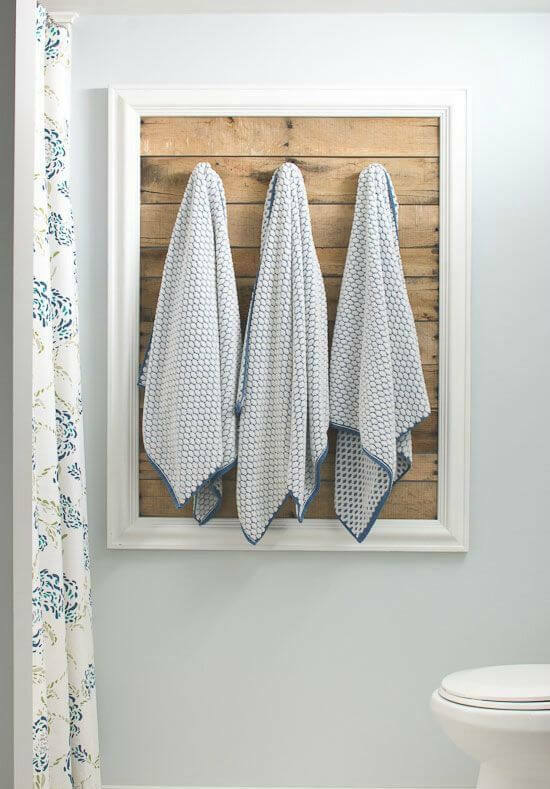 This weathered wood wall decor adds a focal point and more character to your bathroom than a towel bar, even an expensive decorative towel bar. What is even better is that this DIY towel rack can be made from inexpensive, reclaimed items. There is nothing in your bathroom that can’t be changed to a bit of unique rustic decor with DIY bathroom ideas. Stencils and paint can help you turn a inexpensive, plain shower curtain into a more unique and expensive looking shower curtain. You can make your own stencils or buy some ready-made at a craft store. Design stencils are available as well as letter stencils. 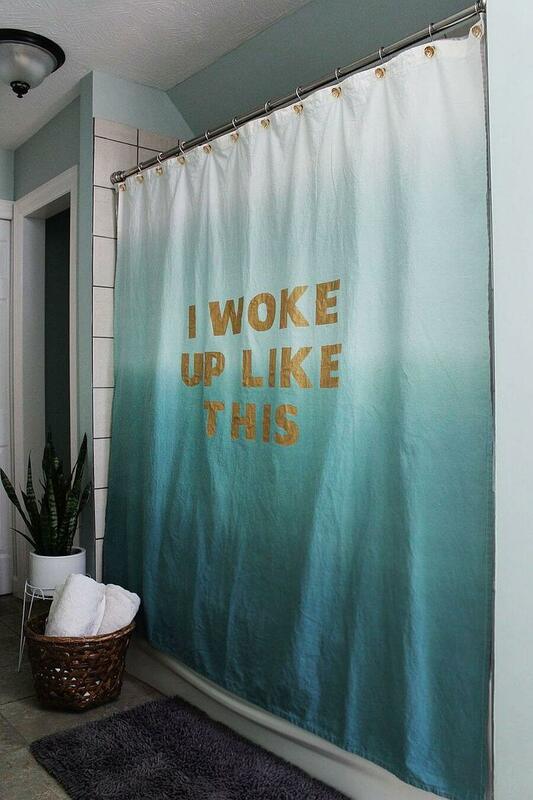 Expanding on this idea can provide you with a shower curtain that will be unlike anyone else’s. 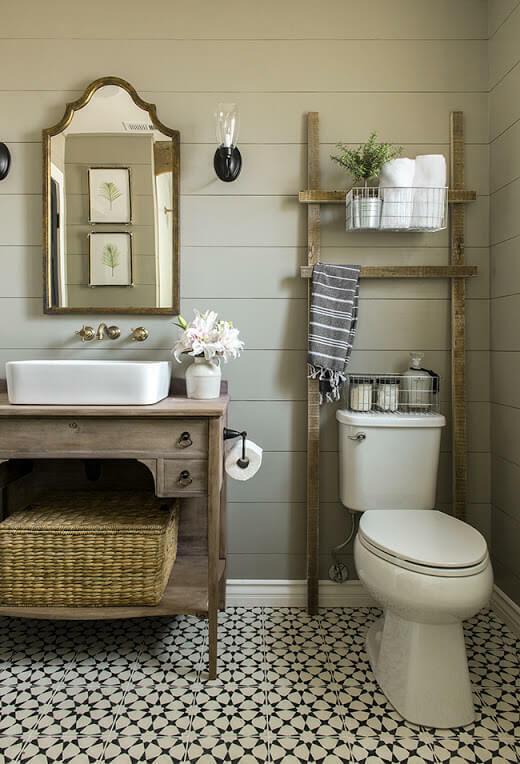 Tub caddies are another place in the bathroom where you can add a decorative touch to a utilitarian item with DIY bathroom ideas, and if you are trying for a rustic look, a wood tub caddy is perfect. You can use weathered-look wood or a more finished looking wood. 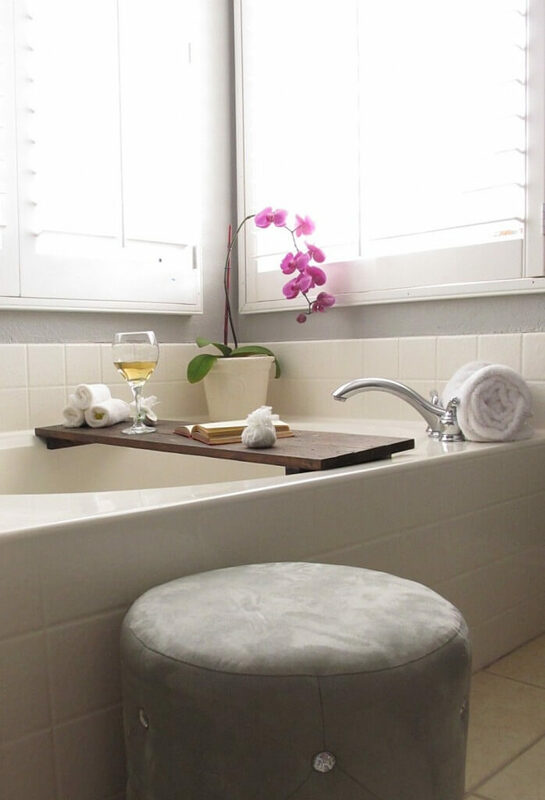 Whichever you choose, your tub caddy will help you create a private getaway in your bathroom. Now, you are ready to make some changes to lighting fixtures, and that doesn’t mean buying new ones. Just buying some paint can change any light fixture from a shiny modern silver look to more of a vintage look. A bronze metallic paint will really give a warm vintage look. Then, changing the globes to canning jars will finish the look. Even inexpensive, DIY bathroom ideas on small items in your bathroom will add more warmth and character than you might expect it to do. This antique-looking sign adds humor and a serious message to the bathroom. This sign was created with a board that has been white-washed, made to look weathered, sanded, and then, had metal letters attached. Easy DIY bathroom ideas such as this can be part of a wall art arrangement or fill in under a self as seen here. 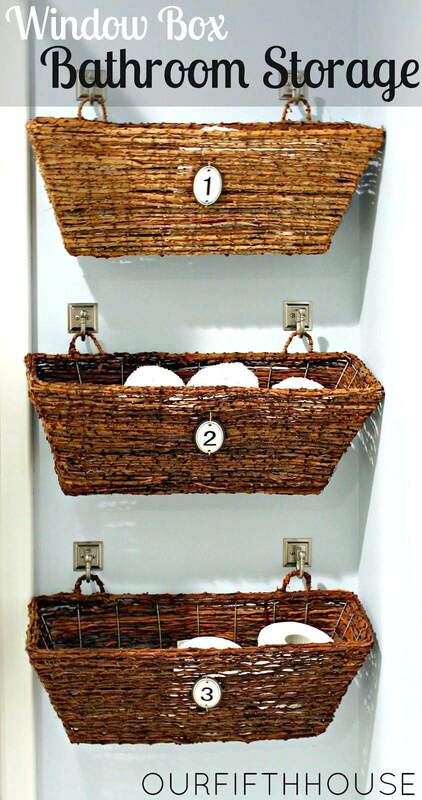 Wicker baskets will add a rustic look and storage to any room. The great feature of these wicker baskets are the two loops on the back side of the baskets that allow them to be hung on the wall. This gives you the opportunity to place them on the wall as you would shelves, creating a more unique and decorative wall storage display. Your bathroom vanity does draw attention, and the wood can look outdated or worn. 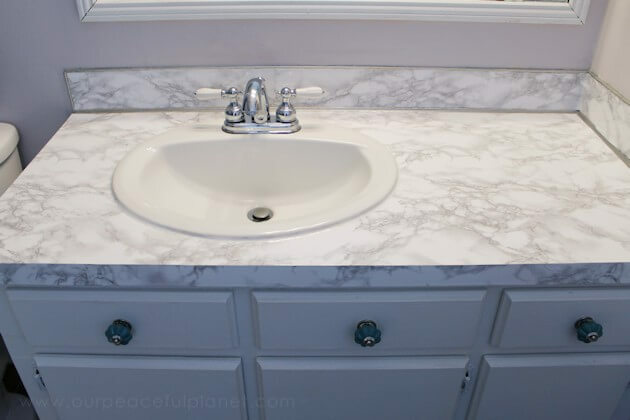 If your vanity needs help but you would rather still have the look of wood rather than a painted vanity, you don’t have to buy a new vanity or go the traditional refinishing route. Just try the gel stain recommended in this idea. You will find it less expensive than a new vanity and easier than the traditional staining route. 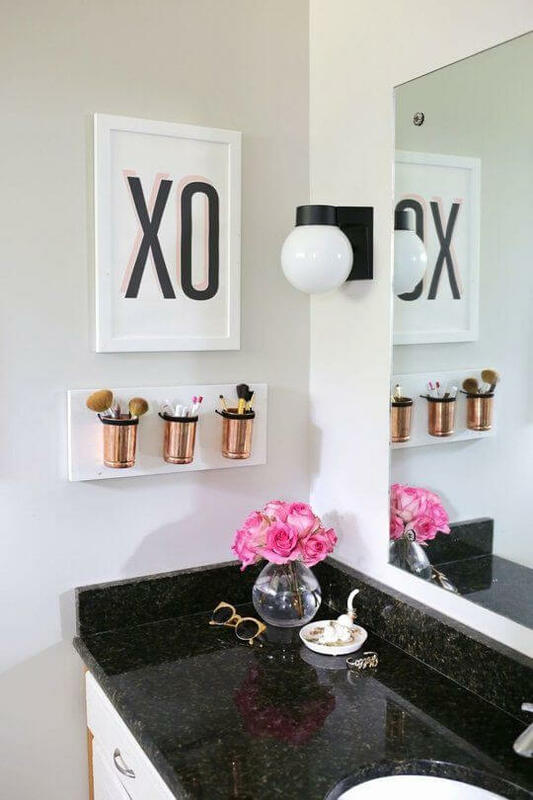 Vanity trays in the bathroom help organize your countertop and create beautiful displays. this is one place where DIY bathroom ideas are only limited by your imagination. So many items can be repurposed to used as vanity trays from framed mirrors to wood crates. This idea used the lid of a hinged wood box. The bottom of the box was used for another project. Wood blocks were attached with glue for legs, and then it was painted, creating an easy, inexpensive DIY vanity tray. 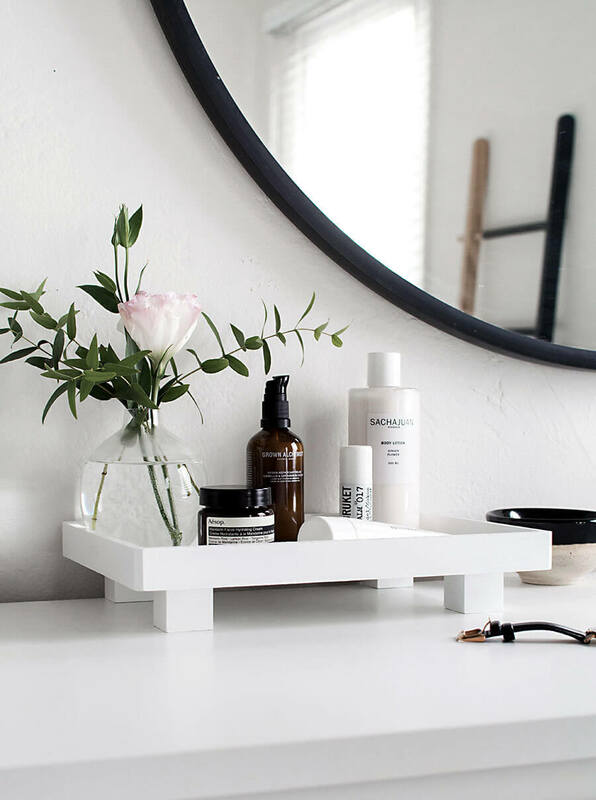 After you have chosen a vanity tray, you might want to consider creating a more uniform look by changing the containers of all your cleansers, lotions, and other items to ones with a more rustic, vintage look. 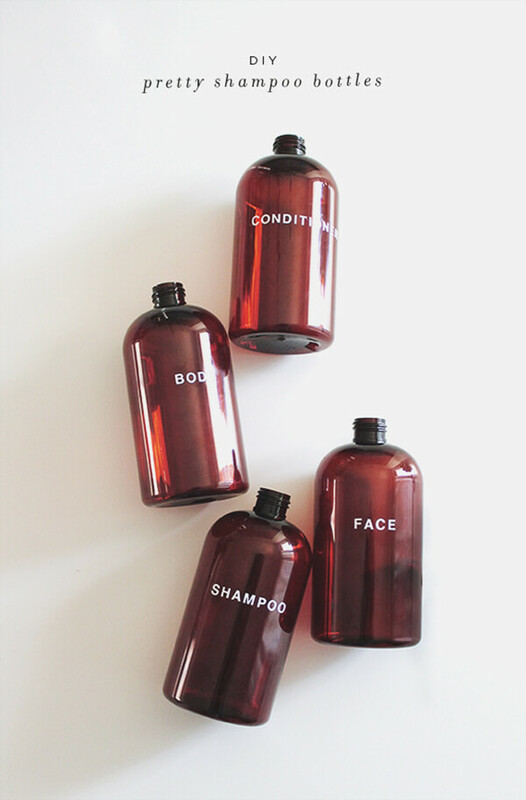 While this is one of those DIY bathroom ideas that is inexpensive, using plain bottles with decorative lettering can create an expensive look. You can also add some decorative stickers or stencil some designs on the bottles. You will want plungers for some of the bottles. 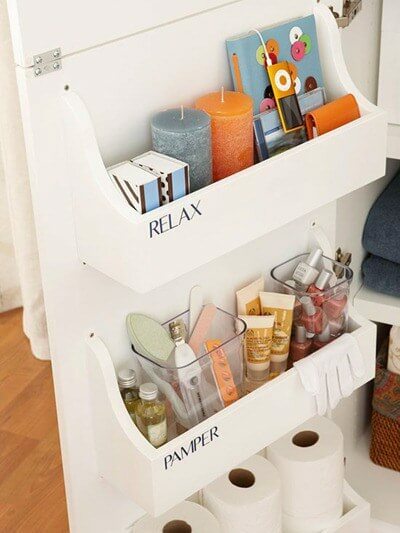 One last organizational and storage idea for those bathroom essentials that look like clutter when sitting out in the bathroom but are too small to sit in the vanity cabinet. Use this free pattern to create storage bins for the back of the vanity doors. You can then look inside the cabinet, and consider whether baskets or shelves might help you organize the rest of the items under the sink.